Steven James writes the kind of stories that could be used to teach a course on suspense writing. They’re intricately plotted, expertly timed, and built around characters with layers, edges – whatever you call them, they’re believable and fresh. Far from being obvious, all that craft comes across as effortless, meaning they’re must-reads for lovers of the crime thrillers he’s been specializing in since the beginning of his Patrick Bowers books, which all feature chess-themed titles. James’ latest in the series, The King, is all of the above, with a spiritual component woven so neatly into the fabric of the plot that the questions raised about the nature of good and evil linger long after the story ends. In its exploration of the psychology of serial killers, the cat-and-mouse game between predator and prey, it belongs on the shelf next to Thomas Harris’ legendary Hannibal Lecter books. Yep, it’s that good. When The King opens, FBI agent Bowers is picnicking with his adopted daughter Tessa, preparing for his marriage to FBI profiler Lien-hua Jiang. But two separate conflicts, seemingly with no connection to each other, are gunning for Bowers. One involves serial killer and – gulp – cannibal Richard Basque, and his insatiable appetite – pardon the pun – for revenge on Bowers after putting him behind bars 13 years earlier. First Basque goes after Jiang, then sets his sights on wreaking havoc on the rest of Bowers’ life. Basque relishes the chase, leaving clues for Bowers while remaining just out of reach. In his pursuit, Bowers craves revenge on Basque for his abduction and terrorization of Jiang, and is forced to consider the similarities between the two men. What separates the monsters from the “rest of us”? Bowers wonders, and it’s a problem that plagues him throughout the book. Meanwhile, a Russian terrorist code-named Valkyrie plots his own sort of revenge: on the country that trained him to be a ruthless killer, a path that ended with his murder of his own wife. His method involves counterfeit prescription anti-depression medication that drowns the user in suicidal thoughts. More than simply a sub-plot, Valkyrie provides a counterpoint to the themes introduced in the Basque conflict, which both stretch Bowers to his breaking point. The best recipe for enjoying The King involves a long stretch of un-interrupted time and a mind open to considering its themes. The book is dark, especially in the passages describing the psychology of Richard Basque. So dark, in fact, that the story might be a turn off to some. But alongside this darkness is the redemptive story of Bowers and his adopted daughter Tessa, a high school senior struggling to emerge from her own haunted past. For most of the book, Tessa grapples with life’s big questions while putting together her graduation speech. Her interactions with Bowers and Jiang provide some of the novel’s most enjoyable moments. And, like most details in the story, Tessa’s conflict becomes enmeshed in the novel’s primary two conflicts. It’s James’ nuance for character, his eye for detail in scene-building that makes The King a rich, satisfying story. But it’s the meatier issues – good vs. evil especially – that makes the novel feel like so much more than a throwaway tale. Sure it’s released in mass market paperback, typically the vehicle for the most disposable form of pop fiction, but that’s deceptive in this case. 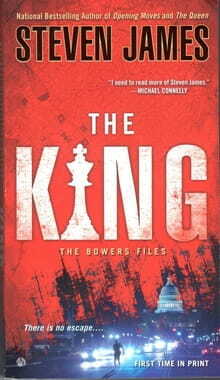 James’ labor over the story is evident throughout, and the revelation on the final page that there’s one more installment of Bowers’ story, Checkmate, arriving next summer, should have fans screaming hallelujahs.